Guest Posts Wanted: Are You an SEO Expert? So, yeah, we can get a tad picky when it comes to selecting guest bloggers. But, you never know, you might be able to pass our standards. Still interested in writing for us? We’re always on the lookout for guest contributors, so if you have killer writing ability, want to reach a large audience and get a tasty backlink in the process, you might be a perfect fit. Must be high-quality, unique, and 500 words plus: You don’t need to be an SEO expert to know that Google loves high-quality, lengthy content (and if you didn’t know that, maybe you shouldn’t be on this page — sorry!) We won’t host content that has previously been published elsewhere. Fresh and interesting: We know that you won’t always be the first to identify a new trend in digital marketing before it blows up, and we don’t expect you to! However, if you can provide an interesting take on an existing topic, or present something in a new and exciting way, we’re all for it. Well-researched: We’re big fans of backing up our points, so whether you want to submit the findings of a data-driven experiment you’ve conducted, or are submitting a guest post on an evergreen subject, make sure you back it up with relevant citations, original opinions, or recent examples. Something that provides value: Any article you submit to us should always be written with the user in mind. Our visitors love actionable tips and strategies, so when you’re writing your content, think killer, not filler. We’d much rather have a concise, shorter piece of content than something padded out just to knock up the word count. Has personality: At Ardor SEO, we’re serious about digital marketing, but we’re also fun. We love what we do, and our audience knows it (our CEO isn’t known as the ‘Coolest Guy in SEO’ for nothing!) We write in a conversational tone, because learning about reputation management can be fun too, you know? If you write in a drier, more formal tone and your audience love it, then great, but it won’t necessarily be something that resonates with our audience. Author bio and high-res image: Obviously, we want to attribute your article to you, so don’t forget to send us a short and sweet bio that perfectly shows off you and your business, along with a picture of your friendly face. 2-3 quality images from free or stock sites: Images break up guest posts really well, because, let’s face it, nobody likes to read a wall of text. Please make sure you have the rights to use any images you source or attribute them where appropriate. Some of our favourite sites include Pixabay and Flickr. Graphics, graphics, graphics: If you’ve created any graphics yourself, including infographics or tables, then throw them into the mix! Our visitors love visual content, and it’s a surefire way of making sure your article is seen by more people. Internal links: Internal links are powerful: they show Google how a website’s pages link together, allowing link equity to flow downwards from the homepage to all it’s other pages. This results in better ranking of your content, which we both know means more traffic, more exposure, and more referrals to your site. 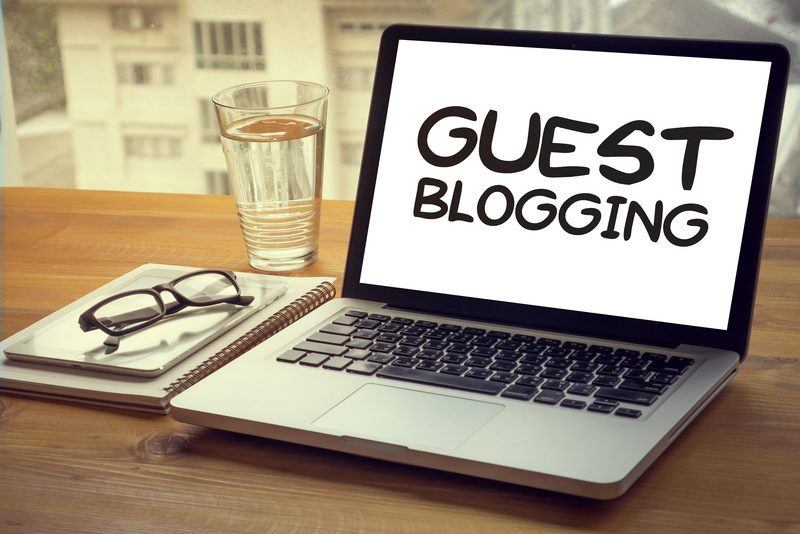 Guest Blogging: What Should You Write About? It’s perfectly fine if you don’t have a completed article to send to us straight away. If you have a few ideas and you aren’t sure what would be the best fit, get in touch and we’ll let you know! You’ll receive a great contextual backlink from Ardor SEO (we only host high-quality content from guest bloggers in our niche), and it won’t be buried in a small author bio box that you’d have to squint to see, either. As a special gift, our resident SEO experts would love to offer you a video audit. A member of our team will delve into your current strategy and give you actionable tips on how to drive more traffic and convert more visitors! If you think you’d be a good fit for our SEO Authority Guide, and want to submit a guest post, send us a line via the form below and we’ll get back to you sharpish.